Hotel Avanti is perfectly located for both business and leisure guests in Tokushima. The hotel offers guests a range of services and amenities designed to provide comfort and convenience. Luggage storage, Wi-Fi in public areas, car park, elevator, safety deposit boxes are just some of the facilities on offer. Guestrooms are fitted with all the amenities you need for a good night's sleep. 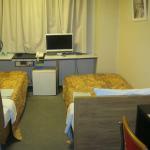 In some of the rooms, guests can find television LCD/plasma screen, air conditioning, heating, wake-up service, desk. The hotel offers various recreational opportunities. Discover all Tokushima has to offer by making Hotel Avanti your base.